Summary: This project will provide equipment, maintenance and fuel to continue our increased nightly effort to encounter as many females as possible, to tag new turtles and identify recaptures, to collect as much information as possible about this lesser-known species. Nest numbers are rising exponentially in the Carr Refuge and in the State of Florida, yet we still know very little about this species. The 2009 season is expected to be a “high” season and will probably encompass nearly four months of extra effort. As more turtles are tagged and encountered we will learn even more about how leatherbacks are using Florida's coastline for nesting. In 2005, for the first time, turtles tagged at Juno Beach were encountered nesting in the Carr Refuge. Turtles tagged by UCF since 2000 have been encountered nesting at New Smyrna Beach, Daytona Beach, Canaveral National Seashore, Hutchinson Island and Juno Beach. 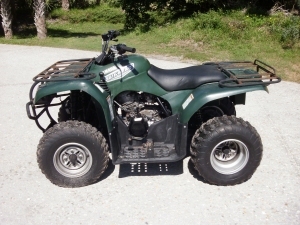 Results: With the grant provided by the Sea Turtle Grants Committee, the UCF group was able to purchase one Yamaha Big Bear 250 All Terrain Vehicle (ATV) used specifically for the purpose of searching for leatherback turtles during the 2009 season. This ATV was a great addition to our project and can be used (hopefully) for several seasons in the future. The 2009 season was expected to be a high nesting year for leatherbacks, and it was in some areas, but not so in the Carr Refuge. We were anticipating a total of perhaps as many as 60 leatherback nests in the Carr Refuge but when the season ended we had counted only 23 nests within the UCF portion of the Carr Refuge and another 13 nests on the beaches to the north in the Central Brevard Study Area and two nests in the north end of Sebastian Inlet State Park, also monitored by UCF.For the previous ten years leatherbacks have maintained a biennial pattern similar to that of green turtles. In 2009, however, in what was supposed to be a high year, leatherbacks changed the pattern and produced only 23 nests, about a third of what was expected, and just a few nests more than in the elevated low year in 2008 in the Carr Refuge. The rest of the state showed increases at most beaches in 2009, and the overall season ended as the highest to date in Florida. The turtles that should have nested in the Carr Refuge were not seen elsewhere, so we have no explanation for the reduced number of nests. At this writing, the 2010 season is shaping up to be comparable to 2008, with an estimated 20 to 25 nests.